A collection of notes and links for our MIDI Studio setup and usage. Be the first of your friends to share this webpage on FaceBook! This photo is now way out of date, I need to create a new image for this page. The rack is basically a two column-wide box of 1/2 inch, polyurethaned birch plywood with heavy-duty steel 10-unit rack rails. The rails and related fasteners were purchased from http://www.nice-racks.com -Handmade Studio Racks, a vendor in local Massachusetts. The left-side has just one sliding shelf with the Fostex MR-8HD/CD Digital Multitracker Workstation, there is another sliding shelf planned for under the first one. The top shelf spanning the two sections is set at about a 30 degree angle for easy access to the Boss BX-16 16-channel stereo mixer on top of the shelf, and also easy access to the cabling on the backside of the right section. The face is also set at an angle to easily read the front panels. I removed all the patch cords from the front face for this photograph, there are normally at least 6 cords from the 3 synths, and sometimes as many as 8 cords for the dbx units, all on the patchbay. If anybody is wondering what is on my wishlist - several 6-packs of 18 inch-long mono 1/4-inch patch cords would be sweet! The Boss mixer, the Behringer and an old 1979-vintage Radio Shack stereo mixer have been traded-up to a Roland VM-3100 Pro V-Mixing Station; 20 channels, 24-bit audio bit depth, and MIDI capabilities to control the mix volumes from within the MIDI file itself. Yes, I have practically every AC cord I own labeled by the plug with the device name on a key tag, secured by a wire zip ties. Well, almost everything, stove, refrigerator, and power strips are off the hook. Sorry, I am odd. Over the year, 2011, I have made some changes to this setup, in addition to the VM-3100 Pro, described above. I have acquired a Roland VS-1680 Digital Studio Workstation, which has become my dominent workstation. I also replaced the obnoxious-looking 2U power strip with a RackRider power conditioner and light module. I have also acquired a Roland M-DC1 Dance sound module and a DigiTech Studio Quad 4-in/4-out multi-effects processor. The Studio Quad replaced the reverb and other effects that I had been using the Behringer for. I use two Roland U-110 Sound Modules, each capable of handling 6 MIDI channels, a Roland M-DC1 Dance Sound Module, and a Roland M-OC1 Orchestral Sound Module, each capable of handling 7 MIDI channels and one rhythm channel. I had the two U-110's chained first, using MIDI-In and MIDI-thru to the next sound module, with the M-OC1 the last in the chain, using the MIDI Out of it to the M-Audio USB Midisport Uno MIDI interface (1x1). This output went back to the laptop to save the M-OC1 settings, as it does not retain then after powerdown. I no longer have the synths daisy-chained, due to the fact that I have obtained a MOTU MIDI Timepiece AV, MTP/AV to act as a MIDI router. Manuals - PDF versions of the various manuals for Roland Audio equipment can be found on their website at http://www.rolandus.com/support/product_manuals/?group=1. I have found this resource very handy even before purchasing a device, just to familiarize myself with it and decide if it meets my desires. For my mixdowns, I use a Fostex MR-8HD/CD Digital Multitracker Workstation. This unit provides me with 8 tracks to work with, but only 4 tracks can be used at a time for audio input. This is also the last stage before the monitoring speakers. I have been using the Roland VS-1680 as my workstation more frequently now, because I am no longer limited to having 4 MIDI channels-worth of audio to track; I now typically track 6-8 audio channels at a time. I have slightly modified my system between the Fostex and the speakers. I was formerly using the left and right mono outputs from the Fostex, directly to two guitar amps. Then, I changed that going to my Pioneer home theatre system, using a Behringer Hum Destroyer. Next modification was to remove the Hum Destroyer and use a Toslink cable between the Fostex and the Pioneer VSX-515 theatre system. The threatre system has JBL Northridge E-Series, E60 speakers, which sound terrific with the MIDI files that I create. I have one solid state recorder that I utilize as part of my digital audio recording equipment. The Roland R-09 portable field recorder is hands-down way beyond the consumer-grade micro handheld voice recorders, yet used, it only cost about one-third the price of a Marantz digital voice recorder. Used to edit the downloaded dumps from the various synthesizers, from either the MacBook Pro or the PowerBook G4. The iBook does not have a recent-enough OS X version to run this application. I am currently trying out Suavetech's 0xED, which is a native Macintosh OS X hex editor. It boasts fast editing of large file within a small memory footprint. It is a free Mac application, needs Mac OS X 10.3.9 or newer and the app is currently in version 1.0.7 at the time of this writing, Dec 2010. Used to improve the dynamic range of instruments, especially drop the threshold on quiet portions of the musical tracks, and add depth to drum parts, making them sound quite crisp. I am currently using a dbx 166A dynamics processor and a dbx 266XL dynamics processor for this purpose. I use various music software applications, on various platforms. When I am conceiving chord progressions, I will use an application on my HTC Droid cell phone, called ChordBot, available at www.ChordBot.com. It is available on the following platforms: iPhone/iOS and Android, inexpensively (under $5). This lets me run a few ideas together really quickly and then I will listen to the loop that app performs, tweaking it, etc. When I get something that I like or that I can work with in a MIDI editor, the app lets me export to WAV or MIDI format. Typically, I will export to MIDI and use the built-in email function, sending the resulting MIDI file directly to the email address that I have assigned to the music composition computer. Something like Pro Tools would be nice, but it is out of my hobby budget. The music software that I use for editting MIDI files and playback of misical score is called Noteworthy Composer, by NoteWorthy Software, Inc. ( www.NoteWorthySoftware.com ). It is a Windows application that is relatively inexpensive (under $50) but is packed with many useful features. The musical score created using it can be printed out to professional-looking pages; I personally like to print to PDF, using PDF995, by Software995. PDF995 is available as either freeware or for $9.95; hence its name. It is a great alternative to Adobe Acrobat. NoteWorthy Composer Scriptorium - the unofficial repository for all things NoteWorthy. Sometimes, I just want to build-up a loop, adding an instrument, and building it up some more. I use Easy Beat, ver. 2.2.1, (circa 2005) a macility product, by Ergonis Software. This application runs on Mac OS X. Like most software, it has its own native format for saving composition, but it also allows to save in MIDI format. For that purpose, I will hookup a MIDI keyboard, usually the Akai Professional LPK25 Laptop Performance Keyboard (for backing melody), the Korg NanoPad (for percussion loops), or the Akai MPD16 USB/MIDI pad control surface (for percussion loops). It appears that Ergonis no longer supports Easy Beat, as I could not find the product on their website, but did find this Easy Beat 2.1 Press Release for the GarageBand export feature. Easy Beat does seem to have some problems importing MIDI files created by other applications, but there is an easy workaround for that, using Finder. A good technique is described here on a forum for Roland-brand sound modules. Connecting a synthesizer, or a sound module, to a device that generates the data for music generation requires a cable in the simplest sense. My desire is to be able to control 19 channels of MIDI data, going to three separate sound modules and two keyboards and change the configuration with the least amount of effort. I also need the system to accept MIDI data to and from a computer, and from an Akai MPD16 USB/MIDI pad control surface. 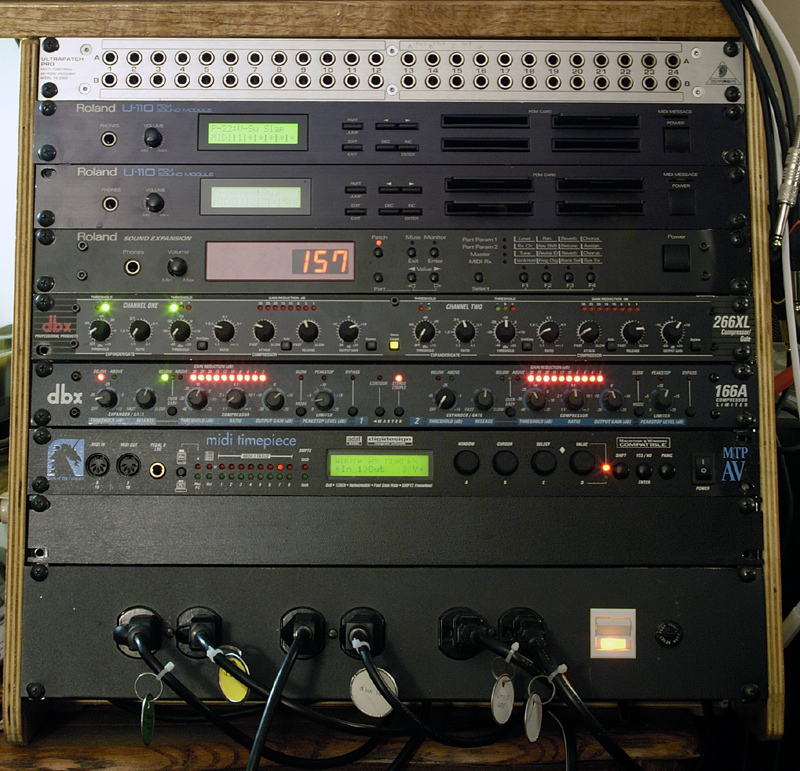 Connecting the computer to the synthesizer rack is accomplished with an M-Audio USB MIDISport Uno bus-powered MIDI interface. It supports one MIDI-In port and one MIDI-Out port. The rack-side of the interface connects to the MOTU (Mark of the Unicorn) MIDI Timepiece AV, MTP/AV. The MTP/AV supports 8 MIDI-In cables (of 16 MIDI channels each) and 8 MIDI-Out cables. While it does have PC and Macintosh interconnectivity, I use it strictly with the front panel controls to configure which sources go where and some other interesting channel effects. If you are looking for a MIDI router or MIDI patchbay, then you should consider this product. I was able to find a used MTP/AV at a local Daddys Junky Music store, for under $80, in near-excellent condition. We have two MIDI keyboards, a Yamaha PSR-172 and a Concertmate (sold through Radio Shack) 980. The Concertmate 980 is a 61-key, polyphonic (12 notes, maximum), MIDI keyboard that is useful enough for a home recording hobby. Private MIDI music studio technical consulting at your location in the San Fernando Valley, Los Angeles and surrounding areas. Private consultants and tutors expert in troubleshooting home music studio setup issues. These include MIDI, audio, recording, engineering instruction and problem-solving. Midi Magic Studio of Nashville is the definitive studio to satisfy all your recording needs. Specializing in all styles of music and dedicated to bringing a personal touch to your next CD project whether you need to record songwriter demos, master quality artist demos or album productions. The question â€˜what is MIDI?â€™ still gets asked by lots of different people who want to get into music production. These days, MIDI is one of the most important ingredients of a home studio setup and has been for the past thirty years since it was introduced. Music Studio offers a complete music production environment for mobile devices with features and a sound quality previously only known to desktop applications and expensive audio hardware. It combines a piano keyboard, 123 studio-quality instruments with sustain, a fully fledged 127-track sequencer, extensive note editing, reverb, real-time effects and much more on a user-friendly interface. Samplitude Music Studio offers artists and musicians everything they need for comprehensive music production and for making creative ideas a reality - from composing and recording to mixing and mastering songs. And all at the highest level and in outstanding audio quality. Fits into your studio and your gigs. The Studio 68 is a great choice for small studios and has all the right stuff for teaching music, too! A Cue Mix A/B function lets you toggle between two mixes while monitoring through headphonesâ€”perfect for both DJ-ing live and listening in on a performerâ€™s monitor mix. My stepson, Joe Martino's band, Of Land and Sea has their first EP, Summertime Serenade, released. They are selling it at the below link for BandCamp.com, as well as on iTunes. Check it out and enjoy! I have created this webpage as a method to document and share our MIDI Music Studio setup and usage, for others who might want to do something similar. Copyright © 2010-2011 by David Wayne Hurd, All Rights Reserved.